A leap second was inserted into the last minute of 2005. This page contains some information recorded around the leap second. I have a Rugby Radio wired to the DCD pin on a serial port, so I can record if the signal is on or off. Each minute of the signal begins with a 0.5 second on/0.5 second off period. The following graph shows the beginning of each minute around the start of the year. Note that the minutes before the new year began 61, 121 and 181 seconds before the new year, indicating that the last minute had an extra second. The full minute of each signal can be seen here. Note that the next minute marker is visible at the right hand side of the graph (at second 61) for all the signals but the third from the bottom. This is the minute with the extra second. The raw data and postscript versions of these plots are also available. Information on the Rugby signal can be found on the UK's NPL web site, including information on how the signal is encoded. A EPS version of the minute marker graph. A EPS version of the full minutes' signal. A text file containing gettimeofday values, the offset from the start of 2006 and the value of the DCD pin. The gettimeofday values were recorded on a FreeBSD machine. Note that the last second of 2005 is run twice. The receiver used is described here. NTP warns of impending leap seconds using two bits: 00 means no leap second, 01 means we are adding a leap second, 10 means we are removing a leap second and 11 means the server is unsynchronised. The NTP project maintains a list of public time servers at stratum 1 and stratum 2. Some of these servers will respond when asked for the value of the leap bits. 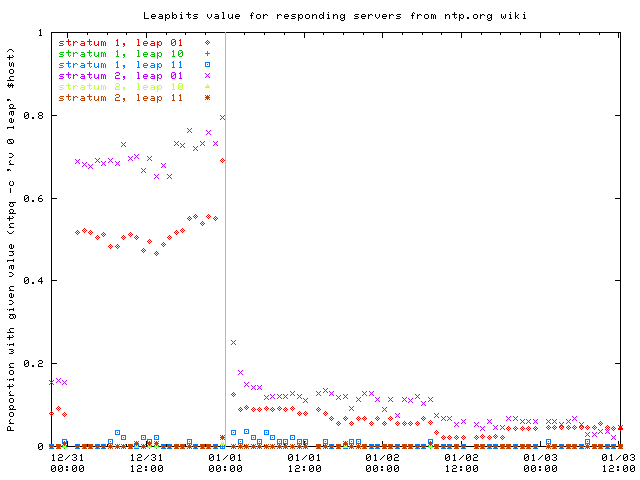 The following is a graph of the proportion of (responding) NTP servers with various values of the leap bits. The verticle line shows when the leap second should have been inserted. The first 3 points are on the Dec 30th, and only a small proportion of servers had their leap bits set. There was a big jump up in the number of servers advertising the leap second 24 hours before it was due to happen, and another jump 1 hour before hand. Interestingly, in the hour immediately before the leap second, one server decided that a leap second should be removed! Unfortunately I missed a measurement in the hour immediately after the leap second, but the proportion advertising the leap second is clearly decreasing. Interestingly, there are a handful of stratum 1 servers that have become unsynchronised after the leap second. 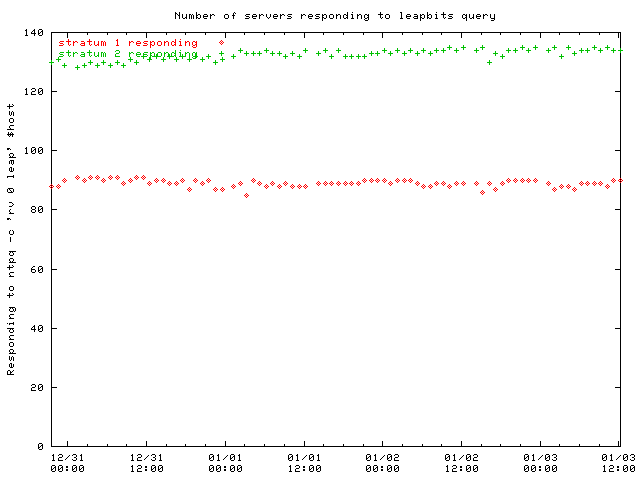 For reference, the number of servers responding was roughly constant throughout the measurements and is shown below. Our Linux machines' kernels logged a message indication the insertion of a leap seconds. On a Tru64 box running xntpd the following was logged. 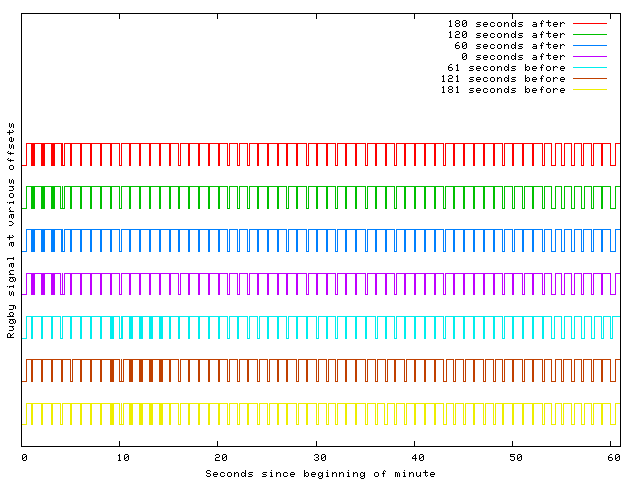 The load on our NTP server (in packets per minute) looked like this. The extra load starting about 10:00 is just extra monitoring we were doing. The extra load starting around 23:30 we're not sure about. The peak at midnight is something that we see most nights. Either our GPS unit didn't output a RMC sentence for the leap second, or it was filtered out by some software between the serial port and my logging. Unfortunately I didn't timestamp the sentences, so I can't tell if it inserted a blank second. It was out of sync, so it may have done nothing. A simple recording of the Eircom speaking clock, made using a MP3 recorder and a microphone held up to the phone. The speaking clock sends a marker every 10s for 0s, 10s, 20s, 30s, 40s, 50s in each minute. As far as I can tell, working with Audacity all these markers are 10s apart (at about XXmY6.8s from the start of the recording). Midnight is marked at about 2m56.8s. There doesn't seem to be a leap second inserted by the clock. It also seems the beeps are about 1kHz and about 120ms long, which I never knew before. 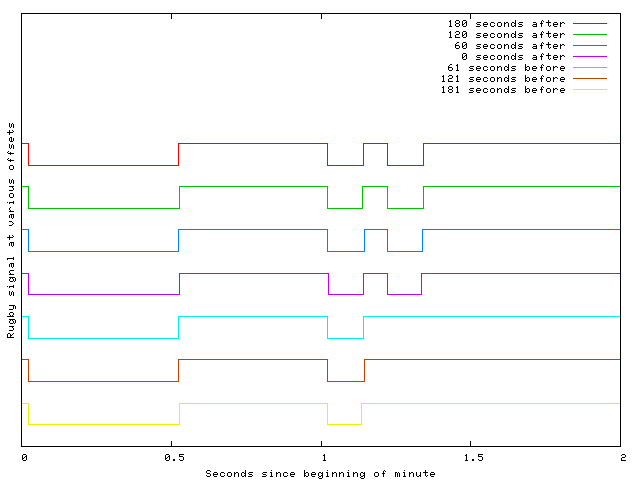 There are some graphs of what a number of our NTP peers did, and a brief explaination of the sort of thing that we saw. Markus Kuhn recording of the Rugby transmitter. Recordings of CHU, WWVB and WWV signals. A recording of some of the European time signals. Tips on watching leap seconds. Ed Davies's description of what the Garmin GPS 12 XL did. PHK's record of what FreeBSD did..
What one NTP server saw. Hal Murray's report on how his servers coped. David Taylor's account of what happened on Windows NTP servers. Serge Bets's post about what his DCF77 clocks did. Richard Langley's recording of the CHU signal and a possible explanation of why some DUT1 offsets were +0.4s.